The Hostelling International (HI) mission, defined in 1932, is one of the earliest examples of sustainable tourism by encouraging a greater knowledge, love and care of the countryside and an appreciation of the social and cultural values in all parts of the world. The concept of “hostelling” implies sharing square metres and common areas that facilitates global interaction and at the same time allows us to achieve a low carbon footprint compared to other accommodation providers. As part of the Ecological branch of sustainability, we aim for our youth hostels and leisure activities to be environmentally friendly and compatible with the countryside. In order to achieve it and among many other initiatives taking place around the world, in 2012 we launched the HI Sustainability Fund. Extra information about HI initiatives and commitments can be found here. What is the HI Sustainability Fund? The Hostelling International Sustainability Fund (HISF) was launched in April 2012. 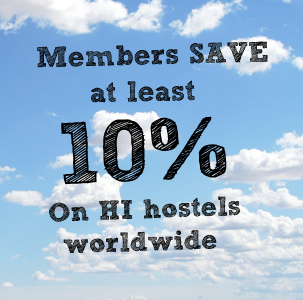 The HI traveller can donate a small amount of money per overnight stay through our booking platform www.hihostels.com to the HISF in order to help our network to reduce their CO2 emissions. The HISF will help hostels financially to implement new initiatives to achieve the targets set by the HI Sustainability Charter and encourage our Member Associations to increase their commitment to sustainability and strengthen our network. Voting Period: 16th July till 30th September 2013 Voting closed! I have just tried to vote for the Pen-Y-Pass project in Englabd and Wales but the site shuts down when selecting the VOTE hyperlink. Is this an error? It seems to be working now, try again. Thanks for voting! I really appreciate this way of supporting unique projects! I wittnessed several sustainabilty projects of HI Bolivia, each of them having deep and longlasting impacts on the bolivian people!